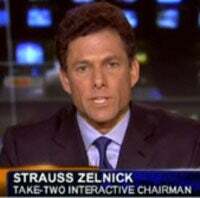 Strauss Zelnick, Take-Two Interactive Chairman, may have enviable cheekbones and impressive compensation, but what he does not have is a grasp on the software issues surrounding Grand Theft Auto IV. With Xbox 360s and PlayStation 3s locking up during GTA IV play sessions, a twelve step "fix" from Rockstar Games support and a host of anecdotal solutions that aren't yet a cure-all, you might wonder where Strauss has been this past week. He answers CNBC's Michelle Caruso Cabrera's question about any post release GTA IV glitches very confidently—and incorrectly—saying "No, you know, no, none whatsoever. I'd say the only issue is that someone came up to me yesterday in a restaurant and said my thumbs were hurting from the weekend!" Tee hee! Oh, Strauss! Are you the chairman of fun, too? At least I'm not the only one suffering from stabbing thumb pain born of constant sprinting. We're not sure if Strauss is being shielded from technical issues or doesn't want the CNBC viewership to know about GTA IV's mysterious freezing problem, but with multi-thousand post forum threads continuing without an official working solution it's hard to swallow this from senior management. GTA IV's performance problems may be limited to a small minority of its owners, but to claim that it's free totally free from technical issues makes you either dishonest or woefully uninformed.